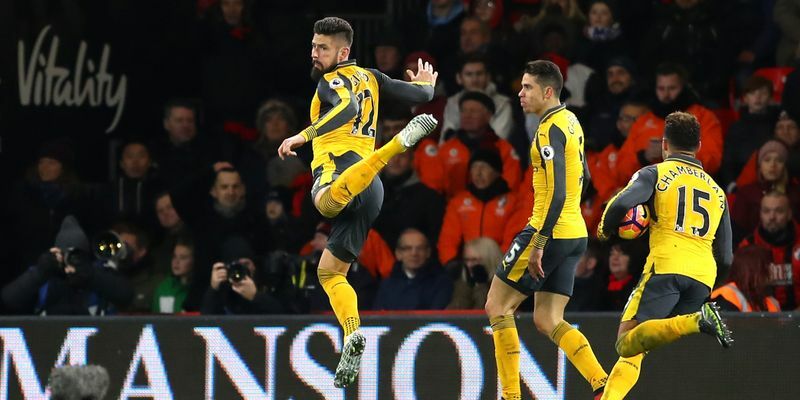 Olivier Giroud continued his goal-scoring spree with a late equalizer in a dramatic game between Arsenal and Bournemouth where the Gunners came back from three goals down to draw 3-3. Crystal Palace’s win-less run continued with a loss at home to Swansea, while Stoke City beat Watford 2-0. Following their wins against West Bromwich Albion and Crystal Palace at home, Arsenal travelled to face Bournemouth with Mesut Ozil still missing from the team. Aaron Ramsey took up the No 10 role behind Giroud, who made news after his magnification scorpion kick goal in the previous game. It all went wrong for Arsene Wenger’s men early on in the match as Charlie Daniels scored the opener after Hector Bellerin was caught out of position on the left flank. Callum Wilson’s penalty and Ryan Fraser’s goal after the half-time tripled Bournemouth’s lead. However, in a stunning comeback Alexis Sanchez and Lucas Perez scored in the space of five minutes before Giroud scored the equalizer in the added time. Despite showing character in staging a comeback in this game, Arsenal still dropped two more points and will now find it difficult to catch up with Chelsea, who face Tottenham today, at the top of the table. Big Sam has been unable to revive Crystal Palace’s fortunes since his arrival. After losing to Arsenal in their last game, Palace once again went into the half-time break trailing Swansea 0-1 as Alfie Mawson scored for the visitors. Wilfried Zaha scored the equalizer for Palace in the 83rd minute only to see Angel Rangel net the winner for Swansea five minutes later. Palace have now won only one of their last 14 Premier League matches as they continue to head towards the relegation zone in the table. Charlie Adam created two goals either side of half-time as Stoke City defeated Watford 2-0 at home. Ryan Shawcross and Peter Crouch got on the scoresheet as Mark Hughes’ men picked up their first three points after a run of five matches without a win. Watford, meanwhile, are on a five-match win-less streak.